Enjoy sunny days at home in the private pool or the bubbly hot tub, or relax in the incredible recreation room which is equipped with a pool table, foosball table, arcade game, big screen TV, stereo, surround sound, and separate mini-kitchen with full refrigerator, microwave and wet bar. All three TVs in the rec room have Direct TV, giving visitors their very own sports bar on game days. This incredible level also features a Master bedroom with 2 Pyramid Bunk Sets, a laundry room, and a hall bath, rounding out the suite of convenient accouterments that will ensure guests will never want to leave. 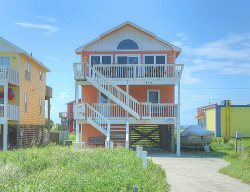 The second level is home to 4 King master bedrooms, as well as a central living room/den with computer and TV for working vacations, or a little peace and quiet. Most of the bedrooms in this gorgeous home have incredible sound views, and four of the bedroom suites contain oversized tubs and separate tiled showers. It’s easy to relax in style in the top level great room, which boasts towering ceilings and walls of windows where the sound views truly shine. The spectacular kitchen is equipped with the gourmet chef in mind and includes VIKING and SUB-ZERO APPLIANCES as well as any kitchen gadget imaginable. The kitchen also boasts 3 ovens, a double refrigerator, wine storage, separate ice-maker, microwave, and 2 dishwashers, and the airy dining area serves as the perfect locale to take part in family feasts. The master bedroom suite, which is found nearby, is a dream come true for weary vacationers and features a claw foot bathtub and a mega separate shower with multiple shower heads, as well as marble floors that can be heated by a thermostat. From a mile-long list of community amenities to a wealth of stunning appointments and not-so-little touches that exude a luxurious atmosphere throughout, Sound Therapy is the ideal retreat for discriminating Outer Banks visitors. Meeting all vacation expectations and then some, this sandcastle is a relaxing gem of a home that luxury-loving Outer Banks fans will want to return to again and again. For the first time ever, guests will be able to rent Club Carts for use in and around the Club (not on the course, but for fun). They can even drive to and park at the beach. The rental company will have an agent on site on the weekends to assist with assigning carts and handing out keys. Guests will be able to rent the carts before they arrive and even have them waiting at their rental home. Club Cart rentals will be for the duration of the entire week, no need for early returns here. For more information, guests may call 252-597-3000. 3.5 mile /10-minute drive to Currituck County Public Beach Access. There is a community trolley available between Memorial Day and Labor Day.